With the construction of the Middle Rhine bridge, the initiators are prepared to accept that 4 ferries will have to cease operations for economic reasons. The ferry operators have already notified the State Government accordingly. The consequence would be that motorists would have to drive long detours to reach the opposite side of the Rhine. According to the VCD German Traffic Club, this would add up to 9.1 million km by passenger car per year. This equals more than 200 circumnavigations of the earth. Pedestrians and cyclists are unable to handle such distances. A bus service would have to be provided for these groups. 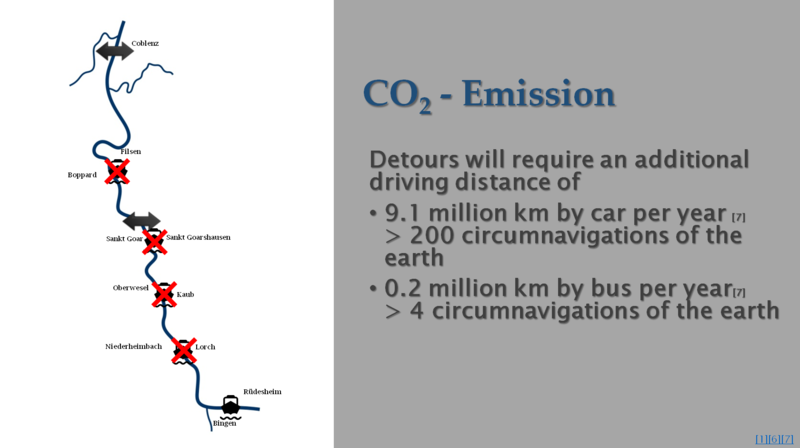 According to VCD, this would add up to an additional traffic of 0.2 million km by bus per year. This equals more than 4 circumnavigations of the earth. These aspects were overlooked in the expert opinion by RWTH Aachen.